If there’s one vegetable that my girls will eat, it’s broccoli. They will literally eat it right out of the bag. During the summer, I’m looking to keep my kitchen as cool as possible. 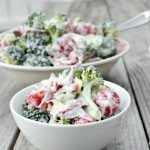 Luckily, our Skinny Broccoli Salad requires absolutely no cooking and it is just as delicious as your grandma’s broccoli salad. All we did was lighten it up. The flavor it still just as amazing. 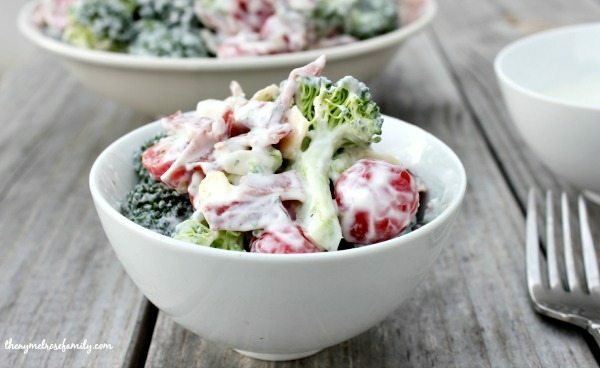 My grandma’s traditional broccoli salad uses mayo and sugar, which is definitely not part of my new clean eating. Hers also uses bacon, but I went with turkey bacon to save on the calories and still get the needed protein from the salad. The best part is that our Skinny Broccoli Salad would constitute 1 red container, 1 green container and 1/2 an orange if you’re using the 21 Day Fix program. Are you wondering how this can be considered 1 red container with just a tiny bit of turkey bacon in it. Wonder no longer! 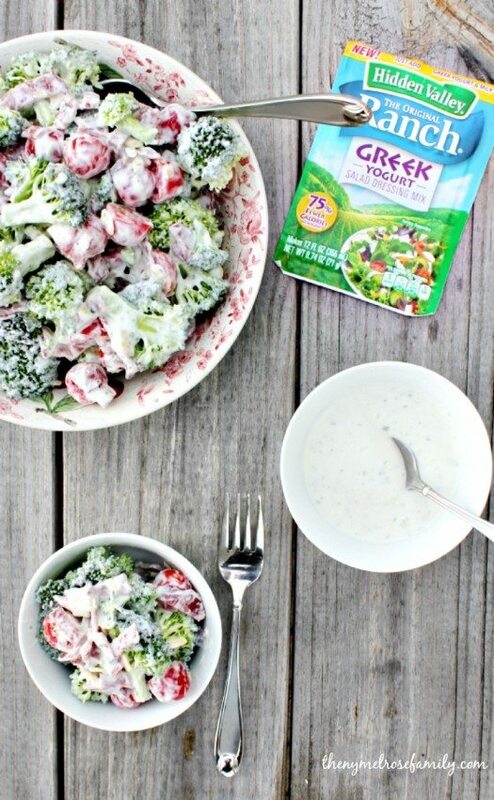 I used Hidden Valley Ranch packets using Greek Yogurt Salad Dressing Mix. In order to make this a red container, non-fat plain Greek yogurt is used. The new Hidden Valley Greek Yogurt Packets are 75% fewer calories at only 5 calories per serving. The new Greek Yogurt packets make it so easy to create a delicious meal without all the calories, but still the same great taste. I can’ wait to try it on my salmon. Preheat the oven to 350 F and line a bake sheet with tin foil and place 4 slices of turkey bacon on the sheet. Bake the turkey bacon for 10 - 15 minutes and then dice once cooled. Combine 1 cup of Greek Yogurt, 3 tablespoons of skim milk and a Hidden Valley Ranch Greek Yogurt salad dressings and chill for 30 minutes. 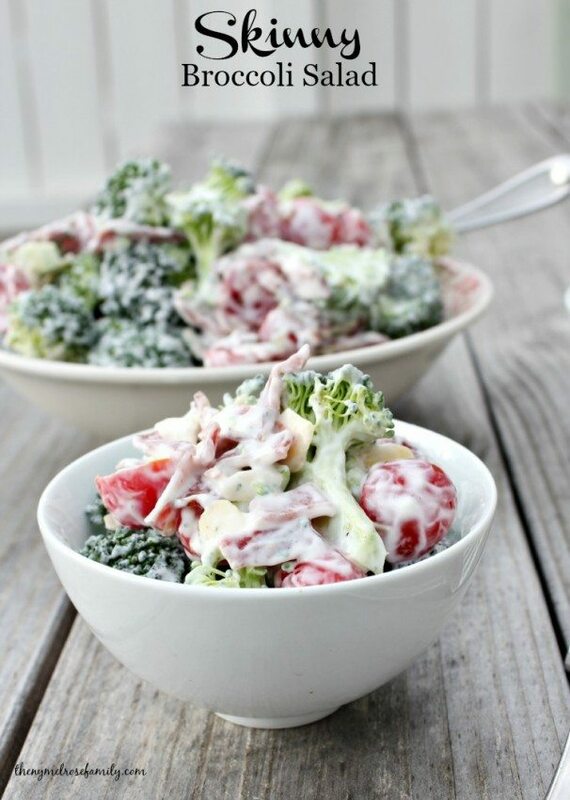 Once the dressing is chilled combine the broccoli florets, grape tomatoes, almonds and the dressing. This is an amazing salad. It looks so delicious and healthy. I love it …. Jenny, this sounds really good. How well do you like this dish? I haven’t used or even heard of using Hidden Valley Greek. Thanks for sharing. I’m gonna give it a try and let you know how I like it!